Will the property generate positive Cash Flow every month? Will the rent exceed the mortgage? If not, will interest deductions, depreciation and appreciation make up for the monthly loss? 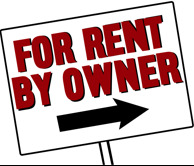 Seek the advice of a person who owns and has been successful with rentals or do research. Most professional planners will not understand the long-term benefits of real estate. So, you will need to do your homework. Have the property deep-cleaned and painted or touched up, the carpets cleaned, and the grounds trimmed, cleaned and swept. Hire a handyman to fix broken items. Check the local newspaper for properties offered for rent in your area with comparable square footage, number of rooms and amenities. For quicker leasing, set the rent slightly below the asking price for comparable properties. Rents are often set as a percentage of the market value of a property (varies by area). A lease is a promise by the Tenant to pay the monthly rent and take care of the property, and sometimes by the Owner to keep heating, plumbing and other systems in good condition. A lease is often the document that allows an Owner to close on the purchase of his or her next home. A lease gives the Owner the legal right to collect rents, collect late fees, or even evict if the tenant fails to pay the rent or violates other terms of the lease. As you can see, the lease is a powerful instrument and must be properly prepared. Good: A neighbor or friend.